Sovereign Stories examines contemporary Native American writers’ engagement with various forms of cultural, political, and artistic sovereignty. The author considers literature’s ability to initiate vital discussions about tribal autonomy in modern America and suggests that innovative literary styles are a compelling articulation of the connection between aesthetic and political concerns. In so doing, he concentrates on fictional and poetic forms, the structure and imagery of which comment on indigenous autonomy, selfdetermination, and artistic activism. 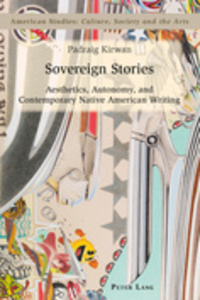 Offering original selective analysis of the fiction and poetry of Elizabeth Cook-Lynn, Sherman Alexie, David Treuer, LeAnne Howe, Louise Erdrich, Greg Sarris, and Craig Womack, this book explores these tribal authors’ concern with intellectual and creative sovereignty and deftly links those interests to the broader cultural and political issues faced by Native American communities today. – Not a Chaotic Wake, Not an Empty Space»: The Future of Art, Life, and Criticism in the Work of Craig Womack and Greg Sarris.